Ever wanted to make your flight simulator? Well, this program has everything you need. You can create theatres of operations, model units, etc… There are several games built around this, the better being Tornado Squadron and WW2. Graphics can either be standard VGA or 640x480 SVGA, with sound support for Sound Blaster and compatibles. 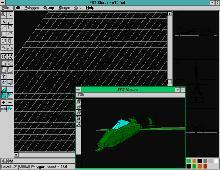 An aircraft’s characteristics are defined in an included editor, but the flight model is somewhat relaxed. This is a good program if you want to mess around with it, but more serious simmers should look for more flexible programs.